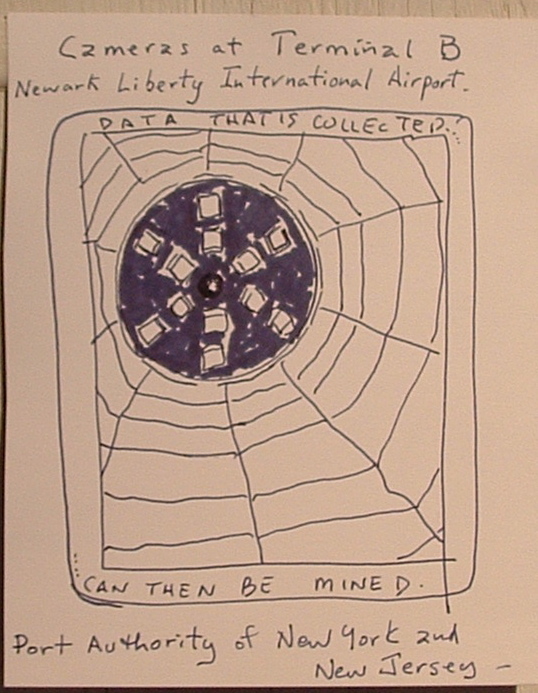 “Using an array of sensors and eight video cameras around the terminal the light fixtures are part of a new wireless network that collects and feeds data into software that can spot long lines, recognize license plates and even identify suspicious activity, sending alerts to the appropriate staff.” from NYTimes: February 18th, 2014, “At Newark Airport, the lights are On, and They’re Watching You.” The authorities are already talking about expanding it to other terminals. This surveillance explosion is a lot like the boiling frog: it starts with slow encroachments on privacy without much visible fussing. By the time all spaces are video taped and microphoned, then it will be too late to change. There are tremendous financial incentives, profits to be made which drive these businesses. And all in the name of security. This entry was posted in Cameras at Terminal B, surveillance. Bookmark the permalink.